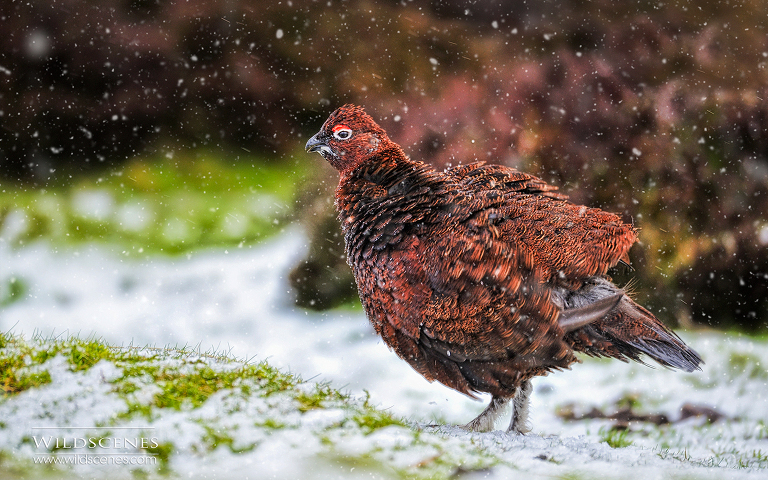 Another in the season’s greetings selection of images, this time a red grouse in a snow flurry on the North York Moors. I took this a few years ago and when I left my house, it was quite bright and sunny. However, by the time I reached my favourite grouse shooting spot near Masham, it had clouded over and gone very dark and then a snow flurry came out of nowhere. Within 15 minutes, the ground had a dusting of snow and the red grouse decided to move on looking for shelter amongst the heather. As he stood up, he shook all his feathers which, in the low light, made for a slow shutter speed which did not stop the motion of the shake. He did, however, keep his head very still and it remains beautifully in focus while the blurred feathers convey motion.